The pumped storage scheme is located within an area of forestry set within a landscape characterised by undulating plateau moorland, Loch Ness and the dramatic Great Glen. It is located within the Loch Ness and Duntelchaig Special Landscape Area (SLA), which is a local designation identified by the Highland Council. The primary aim of the landscape and visual assessment is to provide an objective way of understanding and assessing the likely change that the pumped storage scheme will have on the character and appearance of the surrounding landscape and on views experienced by people living there and using it. 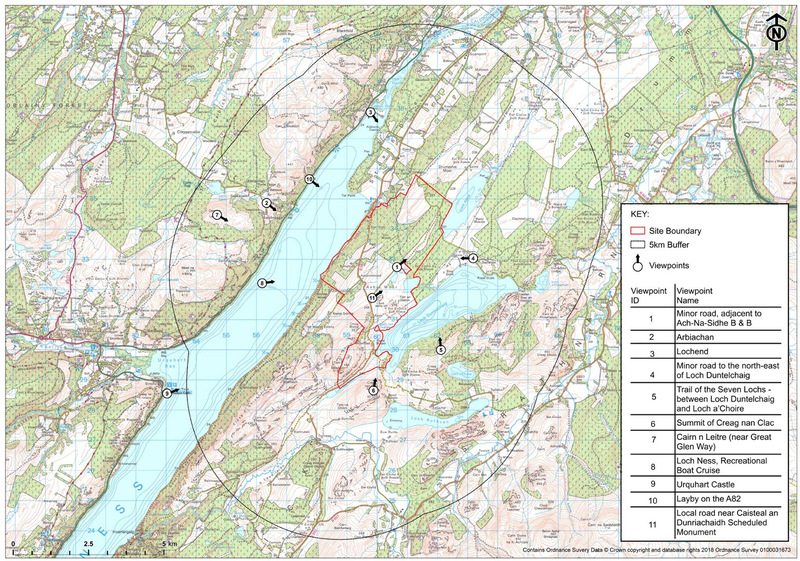 Parts of the pumped storage scheme will be visible from a number of locations in the surrounding area and the map below shows the location of the representative viewpoints used in the assessment. These have been agreed with the Highland Council and Scottish Natural Heritage and are used to help understand the likely change that could be experienced as a result of the introduction of the scheme. As part of the assessment, visualisations of the pumped storage scheme within the existing landscape will be produced to help inform the Scottish Ministers decision. These will be available for viewing within the EIA Report. The landscape and visual assessment is influencing the design of the scheme, helping to limit the effects on the landscape and on views and enabling the design of the scheme to be responsive and sympathetic to the local context. Through a process of careful consideration and sitting of the above ground infrastructure, sensitive design of embankment profiles, the creation of earth bunding with native tree planting and the careful selection of construction materials, the pumped storage scheme will be integrated as effectively as possible into the surrounding landscape.